Hannah White has been described as, “...a dose of hope for the future...pure talent approaching perfection.., to transport you to a magical place...a southeastern Wisconsin resident and a national violin virtuoso” by Milwaukee Journal’s, Paul Hayes, retired, and Pulitzer Prize Winner. Hannah, age 13, has been playing the violin six years and is a third year merit scholarship recipient and member of the Music Institute of Chicago’s Academy Program for gifted pre-college musicians conducted by Roland Vamos and James Setapan where she studies with MIC artist faculty member Dr. Hye-Sun Lee. Hannah is also a recipient of the William Warfield Memorial Scholarship and the Carrie Rondeau Memorial Scholarship Fund. At age seven, Hannah made her first solo debut. 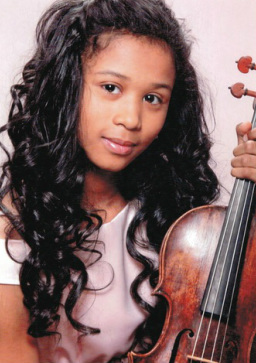 She has been featured as soloist with many orchestras including the Milwaukee Symphony Orchestra, Madison Symphony orchestra under Maestro John DeMain, Oistrach Symphony Orchestra under Mina Zikri, Milwaukee Youth Symphony Orchestra Senior Symphony under Shelby Dixon, Music Institute of Chicago Academy String Orchestra under James Setapen, Milwaukee Youth Symphony Orchestra String Orchestra under Lynn Trinkl, and Waukesha Area Youth Orchestra under Timothy Cobb. Hannah has won First Place at numerous competitions including Music Teachers National Association at the National, Regional and State Level in 2013, Madison Youth Concerto Competition in 2012, Milwaukee Youth Symphony Orchestra Senior Symphony Concerto Competition (the youngest ever to win in the 56 year history of MYSO) in 2012, Chinese Fine Arts Music Competition in 2012, Grandquist Music Competition in Geneva, II in 2012, Sejong Cultural Society’s Music Competition in both Junior Division in 2011 and Elementary Division in 2010, Midwest Young Artists/Walgreens National Concerto Competition in both Category Winner and Overall Winner in 2011, Music Institute of Chicago Academy String Orchestra Concerto Competition in 2011 and in 2010, DePaul Concerto Festival for Young Performers in 2010, Milwaukee Youth Symphony Orchestra String Orchestra Concerto Competition in 2009, Milwaukee Symphony Orchestra Bach Double Competition in 2008, and Kettle Morraine Music Teachers Association in 2009, 2008, and 2007. In addition to these achievements, other awards received include Honorable Mention at the Sphinx Music Competition in the Junior Division in 2013, Second Place at Sejong Cultural Society’s Music Competition in the Senior Division in 2013, Second Place at Society of American Musicians Music Competition in the Junior Division in 2013 and 2012, and Primary Division in 2011, Second Place at Lake Country Baroque Music Competition in 2009, Honorable Mention in the Senior Division 2012 and Third Place in the Junior Division in 2011 of the Frank Stehlik Music Scholarship Contest. Hannah has been a member of the Milwaukee Youth Symphony Orchestra String Orchestra, Philharmonic, and made the rare jump to Senior Symphony at age 11. Hannah has participated in the MYSO Chamber Ensemble Program three years and MYSO Chamber Orchestra. She has been a member of the Waukesha Area Youth Orchestra Sinfonettia three years and WAYO Chamber Orchestra two years. She was part of the Eastbrook Symphony Orchestra. Additionally, she was part of the MIC Academy Orchestra three years. Hannah’s chamber group, Trio Con Fuoco, was nominated and selected to perform at the Steinway Concert Series in Skokie, IL. Her Piano Quartet Centrifugal performed at the Gratz Center, a performance for victims of the Connecticut School Shooting. In addition, her Piano Quartet Centrifugal advanced to compete in the 2013 Fischoff National Chamber Competition. Hannah has appeared in master classes led by William Van der Sloot, Rachel Barton Pine, James Ehnes, Roland Vamos, Christos Galieas, Hana Setapen and Lara St. John. Some additional highlights of Hannah’s musical career include performing for Governors and Delegates, being featured on Chicago’s WFMT’s 98.7 fm Introduction Program, MPTV Black Nouveau (program #2121), KBS Broadcast, and various Milwaukee and Chicago Area Newspapers. She has performed at Milwaukee and Chicago Area Corporations and Businesses, weddings, churches, Bar Mitzvahs and other social engagements. Hannah performed at Mettawa Manor, home of television news anchor and host, Bill Kurtis, for the Lake Forest Symphony Orchestra Annual Gala. Hannah was feature guest artist at the Chinese-U.S Chamber of Commerce Annual Gala. Hannah performed as featured artist at Cedarburg Cultural Center accompanied by her brothers. She was special guest at Hoffmann Estates Ice Skating Festival with skaters choreographed to Hannah’s music. Hannah was nominated and selected to be part of the Beethoven International Project. Hannah was also invited to take part of the Book Presentation Ceremony for Roland Vamos. Outside of music, some of Hannah’s interested include reading her Bible, being home schooled with her two brothers, baking, biking, fishing, golfing, and raising her egg laying chickens. Some of Hannah’s musical passions include volunteering to teach violin to children, performing at senior residences, performing at outreaches bringing classical music to urban areas, and performing solos.